Graves Motorsports 2017 Yamaha FZ10 / 2018-2019 MT-10 Cat Eliminator Titanium Exhaust System with carbon fiber silencer. GMS Exhaust systems are designed for the elite rider seeking top of the line performance, fit, finish and value. 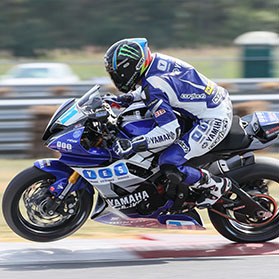 This FZ10 / MT-10 exhaust system was developed using the same technology that has powered Monster Energy Graves Yamaha riders to 6 straight consecutive Moto America / AMA Superbike championships along with numerous 600cc titles. This product is intended for closed course competition use only. Use of this product for any other purpose is strictly prohibited. This Graves Motorsports Cat Eliminator exhaust is designed for the racer on a budget seeking the closest performance exhaust to our full race system. We did not allow compromises in the development of this system. Material diameters, the silencer core size and length are optimized for maximum power output throughout the throttle and RPM range. We use the same 1.00 MM think wall high heat grade Titanium tubing used on our Superbikes. This material is designed special for maximum durability and oxidation resistance up to 800*Celsius / 1472*Fahrenheit. It is designed to live at almost twice the temperature of normal Grade2 Titanium. The tubes are precision bent and cut with the latest equipment available. The tubing is then welded in fixtures designed so that repeatability is second to none. It comes with a single Lambda receiver bung for on track data logging or Dyno tuning. The spring tabs are made from 4MM thick Titanium wire for long life. The 370mm silencer is one piece with the tail pipe welded to the deep draw tapered Titanium entrance cap and attaches to the collector with a 60.5 MM machined Titanium joint for a perfect fit every time. The Collector attaches to the stock mount under the frame with a Titanium tab that has an 8MM machine Titanium nut welded to the tab. The silencer attaches to the motorcycle with a strapless aluminum bracket machined from billet 6061 T651 and anodized black then integrated into the silencer. The silencer sleeve is made of Carbon fiber that attaches to the titanium end caps with stainless aircraft grade rivets and Titanium silencer bands. The inter core tube is made of stainless that slips over the entrance and into the exit cap that is a stamped from Titanium and welded to a 60* slash cut Titanium tube covered with a Carbon Fiber beauty cover. New Diamond Shaped Silencer Design (Carbon Fiber Cans with Carbon End Cap) designed to match the FZ10's "naked line.". 1 Auto Tuner Style Lambda sensors comes standard (OEM dual sensor mounts up front are eliminated for a smoother flowing exhaust. When using any Graves performance system on the 2017 FZ10 Flash Tune products are recommended to enhance the bikes performance everywhere. The most effective tune on this setup does not utilize the stock lambdas at all. I really love the look of this system. I was a unsure about how to go on this bike. I read a fair amount on the forums. I knew a wanted a system that wasn't to loud and still offered the performance and looks. I'm really happy with this buy.. My ridding buddy purchased something else that was short and loud for his FZ10.. now he's cry'n. Build quality is second to none. I added the auto blip and Graves flash.. Thanks for making it easy.